Your new Towny Business Page takes all the great content + deals from the Towny mobile app and makes it available on a web page (a website just for your business!). You can promote your Page anywhere that supports web links - on Facebook, in emails, on your website, in text messages, etc. And it looks awesome on phones, tablets, or laptops! People can learn about your business and preview your current deals - all without downloading the app! And we made it super easy to share your Page on all the popular sites to increase awareness even more! 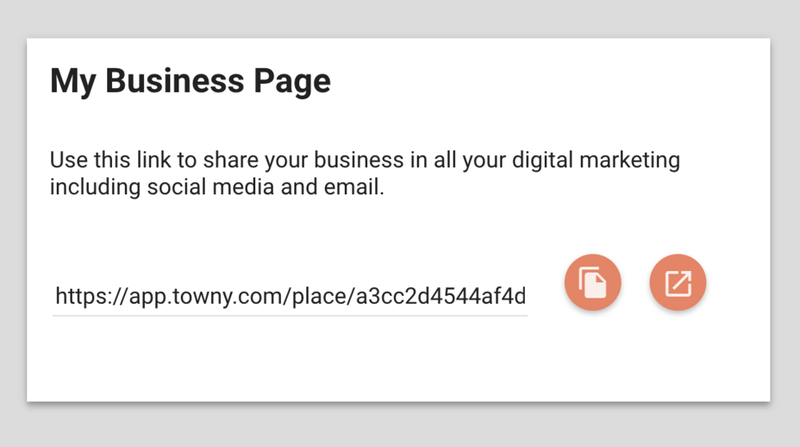 You can easily find the link for your Page on the Towny Business Portal. Log in, go to Locations, and look for My Business Page. It’ll look like the image below! If you have any questions or problems, you can always contact us at support@towny.com.